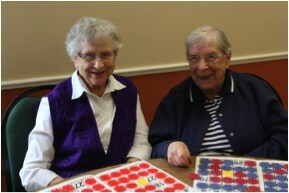 Carol and Betty enjoying a weekly game of BINGO! At Ashton Place, our top priority is to make our residents’ social lives as enjoyable as they can be. To accomplish this, and to keep our guests fully-entertained. We offer a series of ongoing events and recreational activities as well as special happenings for every type of occasion! We enjoy outings and festivals, as well as games and social clubs. You’d be hard-pressed to try and find a time of day when our residents weren’t having a great time and meeting new people! Our Activities Director, Amy Donk, takes charge of lining up a broad portfolio of creative ways to enrich the lives of our residents. In addition, her creativity is unquestioned. Her love of laughter and fun is undeniable, and her bubbly and upbeat personality is absolutely contagious! As a result of the talent she brings to Ashton Place, you’ll find that our activities are well-attended and that your calendar – as our valued guest – will fill up quickly! Here, we have something for everyone, and we listen to all types of feedback. One thing is for sure, at Ashton Place, there is no room for boredom here! We guarantee it! View the Resident Schedule here.